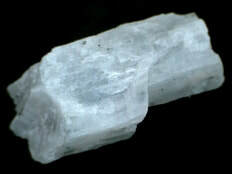 Ulexite is a hydrated sodium calcium borate hydroxide mineral that belongs to the carbonate class of minerals. ​Ulexite occurs as fibrous white or grey to colourless, transparent to translucent crystals with a silky lustre. 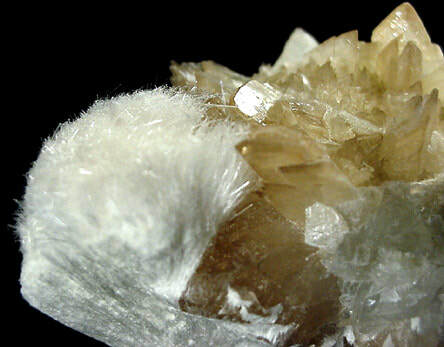 Ulexite occurs with minerals such as borax, colemanite, hydroboracite and other borate minerals. This stone is found in the USA, Chile and Kazakhstan. 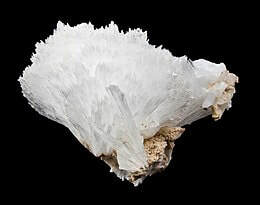 Ulexite is found with the mineral borax and is directly deposited in arid regions from the evaporation of water in intermittent lakes called playas. The playas form only during rainy seasons due to runoff from nearby mountains. The runoff is rich in the element boron and is highly concentrated by evaporation in the arid climate. Eventually the concentration is so great that crystals of ulexite, borax and other boron minerals form and accumulate to great thickness. 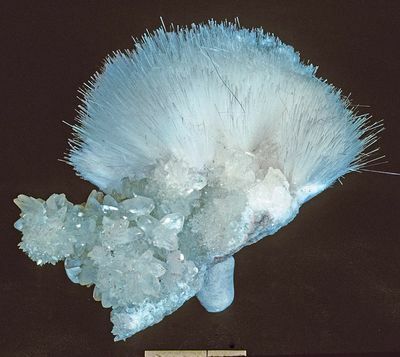 Specimens of ulexite may form a "cotton ball" tuft of acicular crystals. 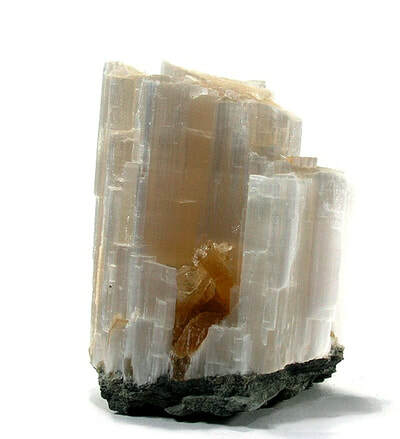 Ulexite is also found in a vein-like bedding habit composed of closely-packed fibrous crystals. This variety is called "TV Rock" and is popular in many rock shops, especially with children. If the specimen is approximately an inch thick and is polished flat on both sides perpendicular to the fibres, then an unusual optical phenomenon can be seen. The fibres will behave like optical fibres and transmit an image from one side of the specimen to the other. In other words, a good specimen, resting on a newspaper will have the writing appear to be on top of the specimen without any distortion of the lettering. 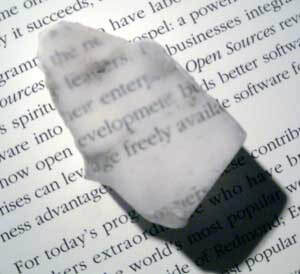 The newspaper can easily be read upon the surface of the ulexite! This is a phenomenal optical property that will stun anyone who has not seen it before. This effect is partially the result of the large spaces in the sodium octahedral chains. Ulexite helps heal and balance physical vision. It can be used to help strengthen your eyesight and to overcome eye fatigue blurred or double vision. It will remove wrinkles, ease headaches. This stone will help in overcoming difficulties with the nervous system, especially with unexplained stabbing nerve pain. Ulexite will improve your memory and concentration. Ulexite restores your ability to use your imagination, be an original thinker and increase your creativity; if these gifts were taken from you in your childhood by unsympathetic teachers or parents. This stone is best for helping you recover from and resist brainwashing by cults or over rigid political or religious regimes. 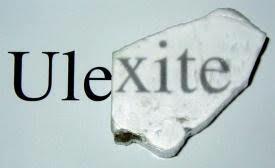 Ulexite increases and stimulates creativity, especially in business. If you feel that things are bigger than they really are, ulexite will bring them back into proportion. ​Ulexite leads you resolution and activating the answer to problems. Ulexite is a stone of revelation, it gives you the ability to see into other peoples hearts and knowing that be able to make informed decisions. Ulexite is a stone of clairvoyance. It helps to open the inner eye to "far seeing". This can manifest as viewing events of the probable future, current happenings in distant places or past episodes that matter in terms of current issues. Ulexite activates your latent intuitive abilities. It sensitises the "self" to the field of consciousness around and beyond the body and allows you to read the energies and intentions of others. Ulexite can quicken your mental processes, allowing you to see the answers to complex problems instantly. This stone can accelerate your learning of foreign languages, mathematics, science, engineering and other fact based topics. Carrying ulexite into study situations, you may experience enhanced memory and a clearer grasp of abstract concepts. Ulexite is ideal for meditation and relaxation. If placed on the third eye is will increase your ability for visualisation and removing negative energy. It balances the Yin and Yang energies and aligns your auras. 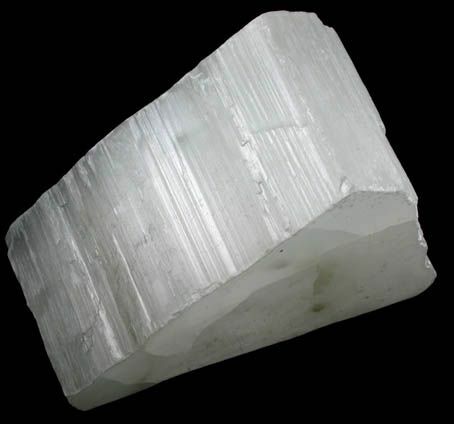 Ulexite enhances psychic vision and insight. If placed on the third eye or brow chakra, ulexite will stimulate clairvoyance and telepathy. Use this stone when doing dream recall as it will enhance the imagery and your understanding of what is being sent to you. Ulexite is a stone of far vision. It helps unblock psychic and physical vision and can enhance you ability to correctly interpret your visions and psychic information. Ulexite acts upon the third eye chakra to open inter-dimensional gates, so that you may see and interact with beings from the higher planes. It also can be programmed to vibrate at various frequencies, allowing you to connect with extra-terrestrials, spirit guides and other entities. ​Ulexite inspires and stimulates visual imagery, visions and information from other dimensions and planets. It opens a window on new and other worlds. This stone facilitates the ability to create and heal by visualisation. It aids willed transformations or reality. It has been known to create new opportunities and realities in your life by being able to see them and then make them real. It will help with manifesting and help with the precision of that manifesting. Ulexite brings things into focus on the inner and spiritual levels, giving you much needed objectivity and clarity. It will help you understand the meanings of dreams and visions. Ulexite shows you the path to take on you spiritual journey.